Last in this series on Rives Quality Meats is this BBQ Turkey. See my previous reviews of their Regular Turkey, and their beef jerky varieties, Regular, Chicago Style, and Barbecue. Rives Quality Meats is a butcher shop located in the small town of Rives Junction, MI. Since 1973, owner Tom Hosler has served the local ranchers and hunters by turning their livestock and game into steaks, chops, burger, and jerky. His own beef jerky was one of his shop's first products, and continues to be a popular item. It was only a year ago that Rives Quality Meats launched a website, allowing folks all over the USA to discover what townsfolks in Rives Junction have enjoyed for so long. The first thing I taste off the surface of these pieces is a light sweetness, followed by a light smokiness, then a light saltiness, and a slight spiciness. In the chewing, the first thing I pick up is the natural turkey meat flavors, with some spiciness, a bit more saltiness. For being billed as a barbecue variety, I do pick up a barbeque-like flavor in this, but not very strong, not like Rives' barbecue beef jerky. In this turkey, if I didn't already know this was a barbecue variety, it would be hard for me to tell if that's the intended flavor. Here and there, I can taste a more defined barbecue flavor, perhaps in the folds and crevices of the meat, where it has greater concentration. As for the dominant flavor of this jerky, it's the natural meat flavors, which is what I found consistent with the other jerky varieties offered by Rives. It's what I notice the most all throughout the chewing. It has a flavor that does indeed taste like turkey meat, and I say that because so many other turkey jerky brands don't really taste much like turkey. The barbecue flavorings perhaps have the second-most dominant flavor. Again, it varies from piece to piece, but I do encounter areas where that unique barbecue sauce flavor shows up quite well, and produces a burst of tangy, spicy, sweet flavor. The saltiness perhaps has the third-most dominant flavor. It's not a strong saltiness, but perhaps medium in intensity, and easily tolerable. I can also sense a faint garlic flavor, perhaps from the barbecue sauce, and also a slight black pepper flavor. Overall, what you're going to taste in this is a noticeable sweet, smoky, salty, flavor off the surface. When you start chewing, the natural turkey meat flavors come out right away, followed by the barbecue flavor, and then more saltiness. These appear to be chunks of whole meat, cut thick, and cut into bite sized pieces. It's a semi-moist jerky, with a wet surface. That surface wetness tends to mix into the chewing, and makes it seem more moist. The pieces tear apart very easily, and they seem to chew easily as well. The chewing texture starts out feeling stiff, but just a tad bit of pressure from my teeth causes it to break apart. I don't get any rubbery-resistance. It tends to break down into a meaty-mass in about 5-10 seconds. By this time, it feels just like eating real turkey meat, similar to moist breast meat. I didn't find any chunks of fat on these pieces, and no connective tissues, or chewy sinews. It seems to be very lean. As for clean eating, each piece leaves a good deal of moisture on my fingertips, requiring a licking and wiping on my jeans. 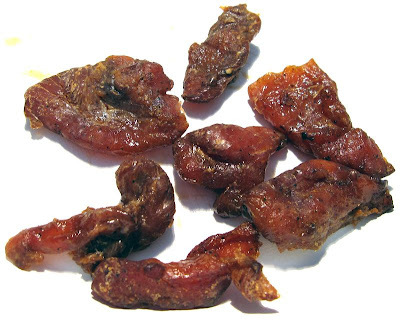 For general jerky snacking purposes, at this $1.25 price per ounce, it's an excellent value. I get a lot of snackability for its great overall taste, it's great meat consistency, and great chewing texture. I'm not sure what Rives' standard price is for this jerky, but even if it was double the price, it's still a good value considering how much snackability I'm getting from it. As a barbecue turkey jerky, at this same $1.25 price per ounce, it's again an excellent value. I do get a fair amount of barbecue flavor, and considering how low this price is for turkey jerky, you can't go wrong. Even as just a turkey jerky, I'm picking up a lot of natural turkey meat flavors. If the price was double this amount, I'd perhaps rate the barbecue flavor as a fair value, and the turkey meat flavor as still an excellent value. This Barbecue Turkey variety from Rives Quality Meats excels for its natural turkey meat flavors, as well as a great meat consistency and great chewing texture. The barbecue flavoring is just a way to add interest to the meat flavors, as opposed to being the sole interest itself. The barbecue flavoring is far better than the mass-market brands, being that it actually tastes like barbecue sauce, and not just the barbecue seasoning salt that so many others use. 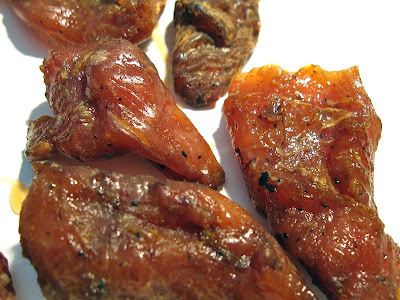 Adding to this jerky's snackability is its soft and moist chew. It broke apart easily in my mouth allowing me to enjoy its flavors without much work. 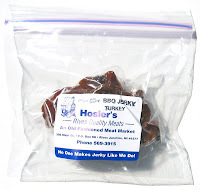 In some respects, it's difficult to identify this jerky as jerky, being that's it's so moist and tender. It's more like smoked turkey, rather than turkey jerky. I suppose it's the shelf-life that perhaps defines jerky from smoked meat. But, I don't even want to let this stuff sit for that long, it's too good not to eat. I think a good beer to pair up with this is a light cream ale, or honey blonde ale. I'd love to try this and was on the web site ready to pay until I saw the $12.97 shipping cost for $7.50 worth of jerky! I've tried it before and I think it's worth it. It's shipped with freezer packs and arrives within 1-2 days so that it stays fresh to your doorstep. I tried the sampler pack, it's $16/lb + $12.70 shipping, so at least if you order more it's a better deal for shipping. I'd recommend the sampler pack anyway, there wasn't one flavor I didn't enjoy! Luckily I contacted them to see if they had a better ship rate. They sent out a half pound of BBQ with $5 shipping. It came double packed in cooler wrap and a cooling gel pack. I guess that's why the shipping was high. It's vacuum sealed so keeping it cool really won't help. I don't think they need to go through all that but it was great jerky. Big thick pieces. Good flavor. They sent a sample of the Hawaiian turkey jerky which I also liked and will order more of. If you like thick pieces this is for you. I consider this some of the best jerky you can get.